PC maker stumbling or shrewd? Dell is in talks to go private, unnamed sources speaking with Bloomberg have told the publication. At least two firms are talking with Dell about taking the long-time tech company off the public trading floor. Several large banks have also reportedly been contacted about financing an offer, backing that could overcome any financial stumbling blocks in buying out the PC maker. Several reports claim that although Dell houses a net cash balance of $5.15 billion (UK£3.2 billion, AU$4.87 billion), only the enterprise side of its business is growing. Though the talks are still in the early stages and might not even amount to anything, a buyout could prove an interesting move by Dell in a time when PC sales as a whole are hurting. 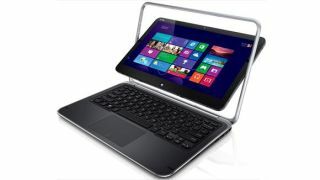 The company, like many others, has come out with a line of Windows 8-based machines, like the Inspiron 15z and XPS One 27 Touch. Although there's no indication Dell is considering going private as a direct result of faulty W8 PC numbers, the fact that PC sales across the industry dropped 4.3 per cent in the fourth quarter can't be helping. According to data from Gartner that was reported by Reuters, Dell sits as the third place PC manufacturer, with sales falling 21 per cent year-on-year. Windows 8, Gartner concluded, didn't have the impact PC manufacturers hoped it would. Dell lost one third of its value last year and, like much of the PC industry, has struggled to regain the hold it once enjoyed as users switch from traditional PCs to tablets. Windows 8 is still new, but if the buyout reports are true they suggest time is running out for Dell to make a drastic move that will keep it solvent. A buyout can be good for a company even it means investors aren't able to trade its stocks (Dell's stocks are enjoying a nice Monday bump on the coattails of the rumored buyout news). Entering into private ownership could amount to more maneuverability for Dell as it tries to stay afloat in a terrain full of pit falls for PC makers. As previously mentioned, the buyout may never happen. It's not even the first time the idea has been floated: Michael Dell said he'd consider taking the company private as far back as 2010. TechRadar asked Dell for comment and was told by a company spokesperson that Dell does not comment on rumor or speculation.